There’s a reason xkcd is my favorite geek comic, and while comic 451, “Impostor” may not be anywhere near my top ten favorites, it really hits my writings here on the mark. The xkcd comics I enjoy the most are the ones I’m able to associate with, either because of their almost plausibility, their that’s so true-ism, their extremism, or their velociraptors. (As a young child, dinosaurs were my obsession.) 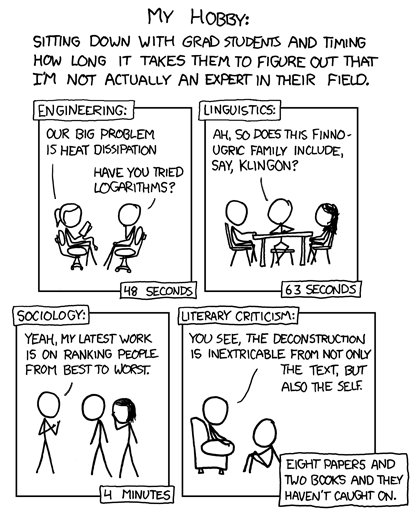 And referentially, it doesn’t hurt that I can find any xkcd comic I’m looking for in one Google search. Now, back to writing posts and waiting to see how long it takes for anyone to catch on!